There’s no denying it: Perth diners love the shiny and new. That’s what makes it even more impressive when a well-worn venue continues not only to fill out, but to remain innovative. Add to that Perth’s temporary memory-loss for beachfront spots during winter months and you’ve got reason to be seriously impressed by old favourite Bib & Tucker. Reason still is the iconic Leighton Beach eatery’s recently reinvigorated menu. Executive Chef and partner Scott Bridger’s love affair with vegetables shine through in a menu that delights loyalists and occasion diners alike. Of course, there’s also that epic Indian Ocean view that never gets old. 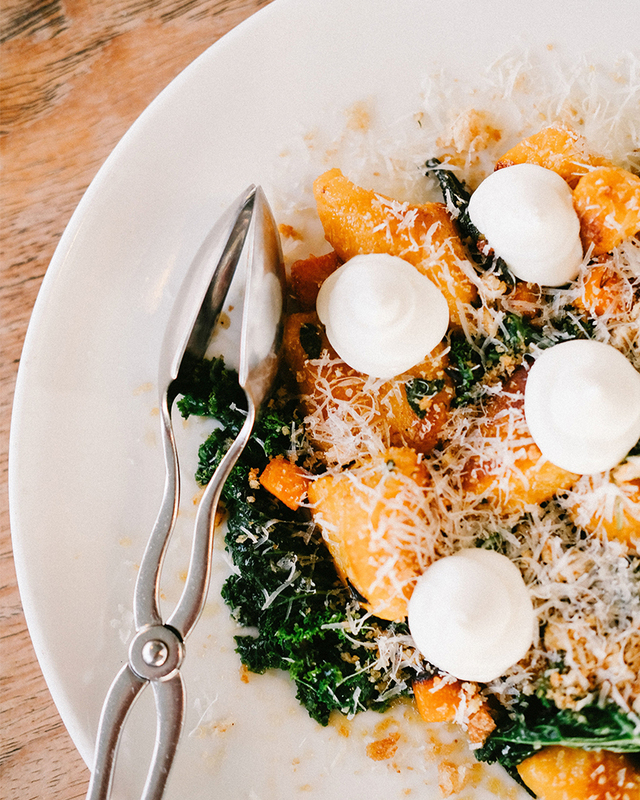 And the pumpkin gnocchi; but we’re getting ahead of ourselves. Those arriving for dinner hungry should look straight to the ‘breads & pizza’ section of the menu—a plate of the flatbread and burrata starts things off nicely. The burrata is sourced from the east coast and is, according to Bridger, the closest thing he’s tried to the burrata of southern Italy. Served with salty fried capers, smoky tomatoes and a dash of Margaret River vinegar, this burrata is so good you’ll almost want to eat it like an apple. The kingfish ceviche, which Bridger sources from Geraldton is a mainstay on Bib & Tucker’s menu, but that’s not to say that it hasn’t evolved. The latest rendition sees both slices and cubes of cured fish bathed in a zesty vinaigrette, with Geraldton wax, avocado whip, edible petals and wafer-like tapioca crisps for added texture. Also in the way of seafood, the wood-fired Exmouth tiger prawns are essential ordering. Served with a light papaya salad, these make for perfect warm-weather eating. From the shared section, the crispy pork hock combines flavours from east and west. The pork is slow cooked and then pressed into bite-sized succulent cubes, dished up with compressed peach and loose witlof leaves from Bridger’s garden in North Fremantle. The dish is garnished with fresh chilli and lemongrass and doused in a honey-based sauce that falls just deliciously-short of being too sweet. Bridger says that regulars have rejoiced the return of the pumpkin gnocchi, which we’ve raved about before. Pan-fried, tossed with sautéed (but perfectly crunchy) kale, roast pumpkin, sage and brown butter, and garnished with walnut pangrattato and dollops of soft goats curd; this is comfort-food as fine as you’ve ever seen it. Round out your mains with an order of the charcoal roasted and incredibly tender kangaroo, which makes for a lighter and leaner red meat option. Three carved portions of roo come served with native plums, slim sticks of sea asparagus and sesame; flavours so fresh you’d almost be forgiven for thinking they were foraged from the very dunes in which you sit. Don’t leave without ordering up a few desserts. The ever-popular Bombe Alaska has survived the menu overhaul, but for something different opt for The Hive; burnt honey mousse (made from home-grown honey, harvested by Bridger’s father) comes served with delicious figs sourced straight from a local Italian lady’s back yard, pistachio wafer and crumb and rose petals. A brand-new vegan dessert is also set to be a late addition to the menu, with macadamia mousse, aquafaba meringue, nectarine and raspberry four-ways combining to deliver ultimate dessert freshness. As far as drinks go, you’ll be pleased to find that the bar is just as obsessed with native ingredients as the kitchen. A West Winds gin and tonic, which come garnished with rosemary, finger lime and pink pepper, go down well on a warm evening, while a relatively extensive wine, beer and spirits list should do the trick year-round. Utter deliciousness and ease aside, it’s a menu (and a location) that showcases Western Australia’s natural and native abundance, and a dining experience that will grow your appreciation of it. All that in stylishly-appointed, laid-back beachfront digs that offer salty pleasure in summer and cosy coastal vibes in winter? Bib & Tucker, we will never stop loving you. Have you checked out Applecross's newest local yet? Get onto it.